The objective of this course is to provide primary schoolteachers, other educators, and people with an interest in place-based learning with some simple strategies and resources through which they can effectively integrate the learning resource of their local environment into the school curriculum. This course is based on ten years’ experience of ‘place-based education’ in the Burren through which scores of teachers and over 1000 schoolchildren have connected with their own locality as part of the highly interactive and experiential Ecobeo heritage programme. The summer training course will cover strands of SESE history, geography and science subjects. Specific themes which will be explored in the field and classroom will include landscape, built heritage, cultural heritage, biodiversity and conservation. On completion of this course, teachers and heritage educators will have the skills and resources which will allow them to deliver an effective place-based educational programme to their students. Equip teachers and others with the skills and resources to deliver a place-based educational programme. Explore skills on observing, questioning, predicting, investigating, designing and communicating around local natural, built and cultural heritage. Provide access to resources such as podcasts, workbooks and other resources that will assist in developing and delivering a place-based education programme. Improve understanding of how such a course can be fully integrated with the school curriculum and enhance literacy, numeracy and ICT skills. Help connect teachers and others with the magic of outdoor learning in a fun and interactive way. Read the below feedback from past courses to whet your appetite! Trips out were amazing, informative. The lectures were all excellent speakers and thorough research was done. As with all the modules there were lots of activities to do and very well presented. All modules were fantastic! All speakers were excellent. Very knowledgeable. I loved being outdoors and exploring, what were for me, new places. I felt all the lecturers were very competent and the content were delivered superbly – with enthusiasm and expertise. We were never left to sit too long – great practical, hands-on activities. Great pace and planning of each day. Great structures to the week in terms of the contact, a very comprehensive intro. The interaction and learning form the Burrenbeo Team who delivered a huge amount of information in an enjoyable manner. The outdoor trips were amazing and the short breaks in the garden reminded me of how important breaks are for pupils. I enjoyed all of the field trips which really allowed us to engage with the landscape. I enjoyed every aspect of the course. The balance between indoor and outdoor activities were perfect. Constant variety and interaction meant the day was stimulating and through provoking. I definitely have an appetite for more! Course run from 9.30am-11.30am & 12.15pm-2.30pm Monday to Friday. Maximum number of people is 20 individuals. Áine Bird is the Education and Communications Officer for Burrenbeo Trust, she is in charge of coordinating the 20-week heritage programmes for primary schools and 10-week programmes for secondary schools in the Burren. She is currently undertaking a Master’s in Education. Prior to Burrenbeo, she was an Education Officer in Glenveagh National Park. She is a member of the national Heritage in Schools panel. Kate Lavender is the Education and Conservation Officer for Burrenbeo Trust, she is in charge of the Burren Wild Child outdoor learning programme for primary schools. Prior to Burrenbeo, she was a Geography teacher. She is a member of the national Heritage in Schools panel. Gráinne Barron is a programmes officer with the Burrenbeo Trust, working on Áitbheo delivery in schools and the community. Gráinne has also worked as a research student within the Earth and Ocean Sciences Unit in NUI Galway. Her research focused on the development of an Integrated Catchment Management Toolkit encompassing outdoor environmental education and GIS mapping. Supported by the Burren Geopark LIFE programme, students in Lisdoonvarna Secondary School participated in a pilot water resources awareness program as part of her research; exploring and mapping the natural and built environment underlying the Aille Catchment in the Burren. With a masters in Sustainable Resource Management, prior to her research, Gráinne worked in an environmental consultancy focusing on hydrology/hydrogeology. 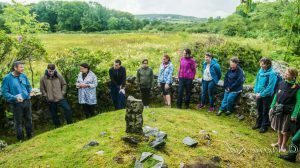 Dr Brendan Dunford is the co-founder of the Burrenbeo Trust, a charity created to achieve greater awareness of the Burren region through place-based education. Aside from his scientific work he leads many tours to children and adults both nationally and internationally in the field and is instrumental in promoting the Burren as a learning landscape. Dr Eugene Lambe is a botanist by background but after sailing around the world on a boat he built himself he has now spent the last 30 years collecting stories, tunes, and songs from individuals across Clare and Galway. Eugene is also a Uilleann pipe maker. Harry Jeuken is an organic and biodynamic farmer in the centre of the Burren. His land is a great example of bringing natural, built and cultural heritage together. Day 1 SENSE OF PLACE – This gives an overall introduction to investigating the landscape where your students live. It focuses on how students can identify things that will give them a sense of place through fun and interactive means. Day 2 BUILT HERITAGE – This module gives teachers the tools to encourage their students to have a better understanding of monuments, artefacts and time periods, enabling students to research their local sites. Day 3 PEOPLE OF THE RECENT PAST – This module gives an increased awareness of historical periods and how people left their mark on places over time, right up to more recent history. The students will have an improved awareness of local dance, music, stories, folklore and art. Day 4 WILDLIFE & LOCAL ENVIRONMENTS – This module improves awareness of how nature manifests itself in different ways in different places, an understanding of ‘natures web’ and how animals depend on plants, and vice versa, and how we can better understand and learn from wildlife. Also how humans interact with plants and animals, and get students to think about our dependency on healthy environments and conservation in their area. Day 5 ACTIVE STEWARDSHIP – This module is mainly focused on projects and outputs that can be undertaken incorporating the different subjects through experiential learning. The training is a combination of indoor-based teaching (Kinvara) and fieldtrips (Burren). 9.30am-11.30am: The morning sessions are based in Kinvara. This will be a mixture of subject-specific learning with interactive activities. Kinvara is an attractive seaside village on the edge of Galway Bay that acts as a gateway to the Burren. Famous for its music sessions, 15th century Dunguaire Castle and of course home to the Burrenbeo Trust. Visit www.kinvara.com for more information about Kinvara. 12.15pm-2.15pm: The afternoon sessions are spread out at different locations in the Burren (Slieve Carron Nature Reserve, Burren National Park, Cahercommaun etc). Instructions on getting to these sites will be given on the day. The option to follow a member of staff from Kinvara will also be available. We do encourage car sharing during the trips however transport is not available so please discuss options with other teachers on arrival. Registration will be at 9am on day 1 in Burrenbeo Trust, Kinvara. A complete programme of the week’s layout will be given on the day. Take the N18 towards Limerick. Approximately 15kms outside Galway in Kilcolgan village, take a right onto the N67. After 10km you will arrive into Kinvara village. When you get to the thatched Merriman Hotel at the top of street, take a right here. The Burrenbeo Trust office is half way down on the right hand side. It is a stone fronted building with a blue door. Take the M18 towards Galway. At Gort town take the N18 going north, again towards Galway. After 11km in Ardrahan village, take a turning to the left. Continue straight for approximately 9kms until you arrive in Kinvara. At the t-junction take a left and enter the village. When you get to the thatched Merriman Hotel at the top of street, take a right here. The Burrenbeo Trust office is half way down on the right hand side. It is a stone fronted building with a blue door. There are slightly quicker ways; we just don’t want you to get lost before you arrive! However, if you have a good map, feel free to turn off the N18 at either Crusheen or Gort going west. Take the M6 to Galway. On arrival at the first roundabout on the outskirts of Galway, take the N18 towards Limerick. At Kilcolgan village take a right on the N67. After 10km you will arrive into Kinvara village. When you get to the thatched Merriman Hotel at the top of street, take a right here. The Burrenbeo Trust office is half way down on the right hand side. It is a stone fronted building with a blue door.